The Fellowes Plasma 150 is a fifteen inch guillotine paper cutter that is designed to cut up to 40 sheets of 20lb paper at a time. The Plasma 150 is equipped with a heavy-duty stainless steel blade and includes an auto paper clamp to keep your document from moving during cutting. It has a foldable pre-assembled SafeCut Guard that prevents contact with the cutting blade and makes storage both safe and easy. The Fellowes Plasma 150 offers a solid metal base, non-skid feet and a 15 inch cutting length to help you complete all of your important projects. It even includes cutting guides for various paper sizes, photos and angled cuts. Check out the Fellowes Plasma 150 guillotine cutter today. Item H x W x D: 5" x 14.5" x 27"
Welcome to MyBinding video. 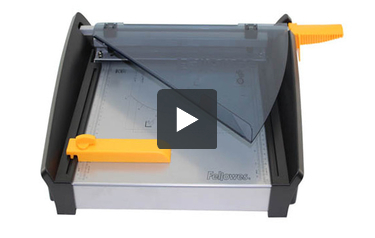 Let's take a look at the Plasma 150, a Fellowes 15-inch Guillotine Paper Cutter. This is one solid paper cutter that does a great job and will last you a long time. Plenty of measuring tools on the top, self-locking blade and finger guard for safety, and a magnetic removable fence for the top or the bottom side that locks into place to make sure every cut is the same every time. Everything stows away and you lift up the shield here to begin working. The 15-inch blade and work table handles easily any standard size and oversize documents. And the cutting action is steady and fluid. It claims to cut 40 sheets of 20lb paper in single slice, so we put it to the test with 20 and then doubled that up to 40 sheets and found there was no problem with the Plasma 150. And there it is, a great guillotiine-style paper cutter by Fellowes. For more demos, reviews and how to's, check out MyBinding.com. Have you been searching for the right guillotine paper cutter? If you have, you need to check out the Fellowes Plasma 150. Here are this trimmer's strengths and weaknesses. Cutting your documents with this device is really easy because the blade is very sharp. It's made out of heavy-duty stainless steel that can withstand a lot of use. You'll just want to be careful using it because it could be very easy to injure yourself if you're not careful. Speaking of being careful, it's easy when you use the Plasma 150. This device has a SafeCut Guard that's essentially a shield. It will keep your fingers far away from the blade so you don't become injured. The SafeCut Guard can fold down so you can store the cutter easily. This cutter has a base that's made entirely of metal. The base has a number of cutting guides on it so you'll be able to accurately cut your documents and photographs. There's even a protractor in case you want to make angled cuts. The base has a rubber feet on the bottom of it so the trimmer will stay in one place as you cut. This trimmer is equipped with an adjustable back edge and an automatic paper clamp that will keep your documents still when you cut them. The clamp locks automatically for your convenience. The Plasma 150 cutter has dimensions of 5" (height) x 14.5" (width) x 27" (depth) so making room for it shouldn't be much of a problem. Moving it around shouldn't be too hard either because it only weighs about 20 pounds. It even has a carrying handle to make transporting it easier. Fellowes is known for giving their products great warranties and that's definitely the case with this one. The blade is covered for 10 years while the rest of the device has two years' worth of coverage. The Plasma 150 has a 15-inch cutting length. This is an adequate length for the most commonly sized documents (i.e. 8.5" x 11"), but you can't use this device for really large paper. If you need a device with a longer cutting length, you should check out the Fellowes Plasma 180. It can cut documents that are up to 18" long. This cutter's handle isn't the most comfortable in the world. You might find that your hands get tired if you use this device for a long time. The Fellowes Plasma 150 is a pretty good guillotine paper cutter. It has an excellent cutting capacity so you'll be able to work with a lot of paper at once. This device is well-constructed thanks to its metal parts and it will be able to provide you with years of use. The cutting guides are very helpful additions and the automatic paper clamp is a nice touch. While it would be nice if the handle was better designed, overall the Plasma 150 is a great choice for your paper cutting needs.